Part of the reason why I hate multiplayer games. If you’re sitting in 4th position and the preceding players all bought Cutpurse, well, you’re kinda hosed. Even 2-player games suffer from Cutpurse, though it’s not quite as bad as Militia (e.g., if both players draw Militia + 4x Copper, player 1 gets a Gold and player 2 gets a crappy $4). It’s also a peculiar card, in that it’s the only non-trashing card I can think of that’s only helpful in the opening. Of course, if you have the Action, Cutpurse always provides that +$2, but in the late game Coppers 1) are probably gone, 2) are probably hard to hit even if they aren’t, and 3) probably don’t matter anyway. Sometimes this isn’t true, if your opponents are playing some sort of weird Copper strategy (most commonly, Gardens or Coppersmith; Moneylender doesn’t really count since they’re trashing all their Coppers anyway), or if it’s an attack-heavy game and every Copper matters, but frankly I’m usually happy to send my Cutpurse to the Chapel after a couple reshuffles. That having been said, it’s definitely a brutal attack in the early game. Compare it to Militia, one of the best opening $4’s: in the early game, Militia is only superior if you draw no Victory cards. But even then, Cutpurse is not really all that worse: this ordinarily means a hand of 5 Copper. Militia drops you down to $3, and Cutpurse down to $4. Either way, the damage is done: it’s cutting you off from the $5 that really hurts. (The rare exception is if you hit a Silver + 4x Copper hand, whereupon Militia gets you down to $4 but Cutpurse only to $5. But even then, going from $6 to $5 is still much worse than going from $5 to $4.) And in multiplayer games, as alluded to before, Cutpurse stacks, but Militia doesn’t. In other words, Cutpurse is probably one of the best early game attacks, along with Sea Hag, Militia, and Ambassador. If you’re feeling especially vindictive, an early second copy of Cutpurse can work wonders: for example, in this game, Celicath’s second Cutpurse cripples my deck advancement and gets Apprenticed later to boot. Finally, when paired with Chapel (or similar early trasher), Cutpurse works similarly to a Militia/Chapel opening, in that it is a good way to boost yourself up while hurting your opponent’s trashing. As if first player didn’t already have enough reasons to celebrate Cutpurse being in the set. Other handsize-reducers (Militia, Goons, Torturer, Ghost Ship, etc. ): just remember to play them first before the Cutpurse! I just read what David wrote about the development of the card, and the original “reduce cards’ cost by $1 in your turn, increase by $1 until the beginning of your next turn” seems even worse, especially in multi-player. A bridge-attack! Actually, cutpurse has one (minor) use in the late game: seeing your opponent’s hand (presuming it doesn’t hit). Since they have to “reveal” their hand, you can see if they are able to buy a province/colony. This is useful if there are only 2 province/colonies left: if you are behind, you want to know if buying a province/colony on your turn will trigger an end of game from your opponent. Interesting! I have never considered Cutpurse in this context. I guess Bureaucrat would be an alternative, though it’s less likely to reveal the hand in the late game. This might helpt in certain setups and doesn’t help in others, when your opponent helds say a smithy and you don’t really know whether he can afford a province or not. One of the results I found most surprising from my opening cards analysis back in December was that Cutpurse seemed to have much less 1st-player bias than Militia. At the time I was also surprised that it seemed to be a much weaker attack in general, but the reasons for that have since become more clear to me. So true! It wasn’t clear to me until I started playing on Isotropic, but if you have a four player game, with roughly equal players, and Cutpurse on the board, Player 4 will lose. And there’s pretty much no way around it. Actually, theory, if you ever get a chance I’d love to hear your thoughts on if there are any good house rules to make the game a little fairer. First player advantage can be huge, and absolutely decides games. I wonder if it’s worth bidding for. My playgroup plays with two house rules: Public scorekeeping, and bidding for first. The system we use is as follows: after seeing the spread, each player chooses a number and reveals them simultaneously. The player with the highest number loses that many victory points and goes first. Ties are resolved randomly, and the winner loses their bid and goes first. In multiplayer games, remaining players bid again for second, etc. Bids in two player games range from 0-3 victory points, with 2 being very common. We don’t play much multiplayer, but I can imagine that in 4p a bid of 4 or 5 might become reasonable in some spreads, though that’s getting pretty scary. I’ve tried to think of alternatives that avoid this, but it’s hard. A flat cost for going first is no good, since reasonable bids vary so much based on the available cards. I’m interested to see if anyone else has thought about this! use Vickrey auction, where bidding your estimate of the value is optimal play to maximize your result. It is not generally optimal, because you might want to hurt other players, but it’s still better than standard auction. Well, the ‘winner of the previous game goes last’ rule is supposed to balance out the first-player advantage, but it doesn’t really work if you’re only playing one game at a time. Maybe the answer is, you’re not supposed to only play one game at a time! Maybe doing ‘winner goes last’ until you get bored, or going around the table and letting each player go first once, would solve the problem. Would keeping a running total of VP scored, and declaring a match winner instead of a game winner, be a good idea? I know scores can vary wildly, but only the difference between players’ scores would be the important part, and I don’t have any numbers to crunch to see how those vary. It seems like it would certainly affect some strategy, at least. Keeping a running tally seems like a terrible idea; it incentivizes players in the lead to waste time buying every duchy and estate before ending the game. Ah, right, I hadn’t thought of that. So much for that idea, then. VP spreads (and even VP ratios) will vary widely depending on the board as well. It’s not even a good measure if it didn’t affect people’s play. If you’re only playing one game, then honestly, I just suggest taking out the worst offenders: Militia/Cutpurse/Sea Hag. I don’t care for equal turns or phantom Provinces, and bidding doesn’t quite work in this game, for the reasons guided stated. Alternatively, what you could do is start the game at a later stage. Give everyone their choice of 4 $3-4’s (maybe even a $5 or two if you feel like it), then shuffle and then play from there. It’s essentially simulating an interference-free first four turns. I actually don’t have an objection to bidding on principle. My post above was about aggregate VP scoring across games. I wouldn’t want to play with bidding just because I don’t think it’d be fun for me–I’d rather just have a random start player for the first game, and change start player per the rules for subsequent games. If you’re bidding, I really don’t think secret bids is the way to do it. Just pick a random player to bid first, and each player in turn may bid higher or drop out of the auction. Allow 1/2 point increments. To open the auction a player must bid at least 1/2 point or drop out. No mind games. If players fail to recognize that a bid is too low and somebody “steals” it for a low bid, that’s the other players’ fault for not bidding higher. If somebody else bids the exact 1/2-point increment you want, is that really a problem? If that was truly your maximum bid, you ought to be indifferent to winning or losing it. If this situation is unacceptable for whatever reason, allow players to bid equal to the current highest bid, and randomly select between any equal winning bidders. OK, I just played a three-player game with Moneylender, Cutpurse, and Trading Post and realized something that I’m surprised isn’t mentioned in this article. Cutpurse actually works well against many early-game Copper trashers simply because it prevents your opponent from having Copper in hand to trash. 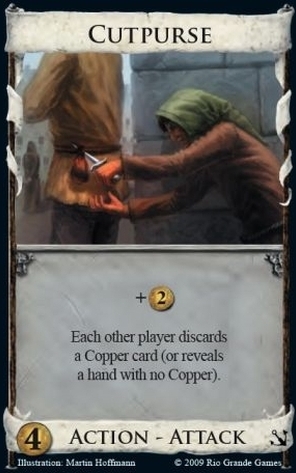 Let’s take a look at the best cards for removing Copper from your deck: Mine, Chapel, Moneylender, Masquerade, Steward, Upgrade, Trading Post, Lookout, Ambassador, Mint, Forge, Trade Route, Loan, and Remake. The vast majority of these require that you have Copper in your hand when you play (or buy) them in order to trash it. Upgrade and especially Masquerade get hit a little less hard by this effect since they may draw you a Copper before you have to trash a card. Lookout and Loan are completely immune to it. With Chapel, you’re trashing things fast enough that you’ll probably muddle through, but it still slows you down. The rest of these are going to be hit really hard by Cutpurse. With Militia, Goons, or Ghost Ship, you always have the option of keeping your Moneylender and Copper in hand and discarding/putting back some other cards. Not so with Cutpurse. My apologies, it is mentioned in the last paragraph, but only as far as having a smaller hand size hurts Chapel. That’s not quite the same as what I’m talking about here. I read through that first sentence and just laughed right there. It really IS awful.